Behaviors of Successful Founders: You’ll find endless ideas about what it takes to be a successful founder—and none is perfect. Internet searches will reveal all kinds of answers. The one that surprises many is that most surveys of founder age for founding new ventures is mid 40s (for example, see Harvard Business Review, 2018, or National Bureau of Economic Research, 2018). Say the word ‘entrepreneur’ or ‘new venture founder’ and the image generally conjured up is of a firebrand techie in his (generally his) twenties. There are many other fallacies, so how on earth do you figure out what’s right. To get a sense of how successful founders make it to the top, I like to use an analogy from rock climbing—yes rock climbing, since starting a new venture can be just as risky. However, I learned some very basic rules as a young man when I went rock climbing—mostly about mitigating that risk. The advice I was given: choose your route; plan and envision your climb; check your equipment; only move one limb at a time; belay before you move; look up to anticipate your next move; lean out and resist the temptation to hug the rock; don’t be intimidated; footwear should allow you to feel the rock, and lastly, learn the ropes! 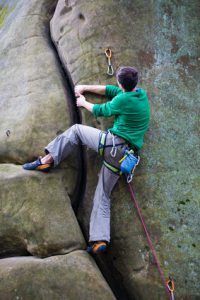 These recommendations for rock climbing are also good advice for behaviors of successful founders. If you have some anxiety—it’s normal! 8 Behaviors of Successful Founders. but remains very much in the present—to deal with the unexpected, rather than being floored by it. There is no simple way of gauging whether a person will make it as an entrepreneur. Indeed, the eight behaviors of successful founders listed above need careful scrutiny. For example, being predisposed to action does not mean that the extravert is the one you want to back. Impulsiveness is not what I’m talking about. Inventors are seldom entrepreneurs, so don’t jump to the conclusion that because you like investigating and innovating, you’re going to be a hit as an entrepreneur. The entrepreneur likes investigating to find a solution to a problem, not just for the fun of the chase. Entrepreneurs are generally life-long learners, but that does not make them academics. It’s learning for the purpose of applying what’s learned. Tolerating ambiguity does not mean indecision. Many people will tell you risk taking is an essential ingredient of new venture creation, but gamblers don’t make successful startups. The behaviors of successful founders are not just skills, but also how they are applied. see profit as a measure of success and competence. Here too, you need to reflect on the implications of what this world famous researcher is saying. An entrepreneur is not always seeking novelty. New things have to work. Deciding when you don’t appear to have all the facts you need, is not entrepreneurship, but an entrepreneur is very good at two things: weighing up the possibilities and using both hard and soft data. The need for achievement does not imply recognition. In fact entrepreneurs often compete more with themselves than anyone else. Nobody can make you be an entrepreneur and your reward will the satisfaction of knowing that you ‘did it’. I suggest that if you intend to start a new venture, you check yourself against these behaviors of successful founders. Your reaction will only be a rough approximation of your chances of success, but if you don’t feel comfortable with the descriptions, it may convince you that founding a new venture is not a route for you to follow. Reaching such a conclusion could save you a lot of heartache. Edwin Land, the inventor and founder of Polaroid said, “A failure is a circumstance not yet fully turned to your advantage.” This might be a mantra for all entrepreneurs. Ask yourself intimidating questions about your own entrepreneurial behavior, and do not be afraid of the answers. Given how long I have been an entrepreneur and teaching entrepreneurship, I have quite a lot of different perspectives on what it takes to be a successful business founder—learned in the school of hard knocks and from penetrating student challenges.